Handmade chocolates, wine & growlers of craft beers. (Nearest stop) M, N, R & D trains – exit Pacific Street Station: walk 1 block North up Nevins Street to Atlantic Avenue; walk West (left) 3/4 blocks on Atlantic Avenue. A, C & G trains - exit Hoyt-Schermerhorn Station: walk 2 blocks South down Hoyt Street to Atlantic Avenue (pass State Street, you will then see Atlantic Avenue); walk East (left) 3 1/4 blocks on Atlantic Avenue. F & G trains - exit Bergen Street Station: walk 3 blocks North up Smith Street (pass Dean & Pacific Streets) to Atlantic Avenue; walk East on Atlantic Avenue (right – pass Hoyt Street) 3 1/4 blocks on Atlantic Avenue. 2, 3, 4 & 5 trains – exit Nevins Street Station at Flatbush Avenue: walk 4 blocks South down Nevins Street (pass Livingston, Schermerhorn and State Streets) to Atlantic Avenue; walk West (right) 1 1/2 blocks on Atlantic Avenue. 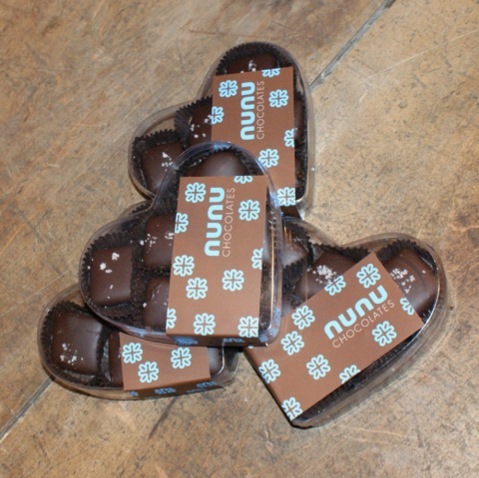 Justine Pringle and Andy Laird are the owners and creators of Nunu Chocolates, a Brooklyn chocolate company that opened its doors along Atlantic Avenue in 2008. At the boutique, a communal table and roomy lounge hosts chocolate lovers, who are welcome to sit and enjoy a cup of organic tea, glass of wine or a perfect cup of not-too-sweet hot cocoa—which we find delicious. The store sells bags of chocolate shavings to make a special cup at home. Since March 2007, Justine has been producing her handmade chocolates to much fanfare. All dairy is organic. Most popular are the hand-dipped salt caramels, sprinkled with Fleur de Sel. Ganache flavors include earl grey, jasmine, prosecco(! ), and espresso brandy, using Gorilla espresso beans. She even custom crafted a beer-flavored ganache for Park Slope grocery and beer emporium, Bierkraft http://Bierkraft.com. Boxes of assorted caramels and ganaches are available, along with chocolate-dipped graham crackers, chocolate bars, and seasonal specialty items for Valentine's Day, Hanukkah, Easter, Mother's Day, Father's Day, July 4th, Thanksgiving, Christmas, and New Year's. Nunu's chocolate mass is produced on a small plantation located in the Santa Ana region of Eastern Columbia producing a chocolate bar bearing the name "Santander". The Santander farm is owned by 1,200 families where the sale of the cocoa goes back into the community to support social development, by creating schools and supporting health care and retirement for the elderly. The plantation practices sustainable farming. The chocolate is organic, but is not certified as they can not afford the certification. While most people do not understand how cocoa is made, the process of creating a fine finished chocolate bar can take months to create. Most cocoa farms sell their beans, allowing others to produce the cocoa mass for the chocolate to then be used by chocolatiers. The Santander plantation is one of the few who choose not to sell the beans to manufacturers, but to produce their own cocoa mass. . . chocolates from cocoa bean to bar! If you are unable to reach Brooklyn or would like to send a gift, Nunu's offers online shopping and next-day shipping. Wholesale orders are also available.